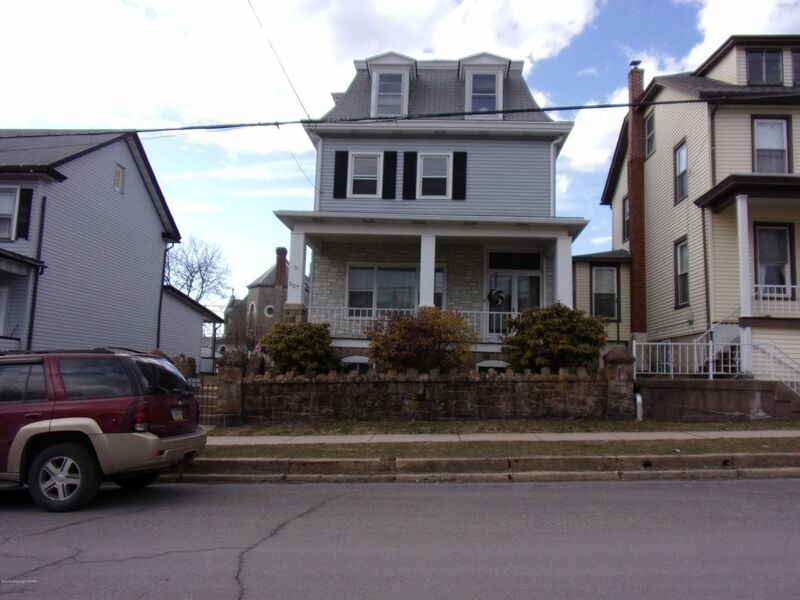 Spacious single on east side of historic Jim Thorpe. Home has large level yard, original stone wall at front plus a 5 door detached garage in the rear with access via School st. A convenient location makes getting to a bank, post office, beauty salon, school (if applicable) house of worship and shopping quite easy not to mention the outdoor amenities such as the gorgeous Lehigh Gorge State Park and Mauch Chunk Lake-both just minutes away! The home features a large 32 x 17.6 living room and open front staircase, lovely space. The front entrance double doors are original to the house. In the kitchen you will find ample cupboard space and the rear staircase from the kitchen to the upstairs! The second level has 3 bedrooms and full bath plus there are two additional rooms on 3rd level. The 2nd level also has a large walk in closet for great storage space plus storage space in basement. There are 4 new heat/air wall units installed in the home, one on the main level and one in each bedroom on the 2nd floor. The electric service was also replaced and the panel updated to a 200 amp box. There are some new windows as well. The 3rd floor features two additional rooms (currently no heat source) but could be an additional two bedrooms. The home features a large front porch and covered rear patio to add to the outdoor space. Directions: Rt. 903 South, left onto 6th St, right onto Center St. home on right heading down Center, sign on.